This week I’ll show you in a series of blog post the latest addition to the Diving Log family – Diving Log Touch. 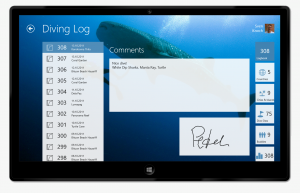 Even though this app is optimized for touch, it runs on any Windows 8 and Windows RT device and you can use touch, a pen or mouse and keyboard or a combination of all. In fact, many upcoming Windows 8 devices are convertibles or tablets with dockable keyboards, which is great for entering data into your logbook. When you start the app, you’ll be right in your logbook. 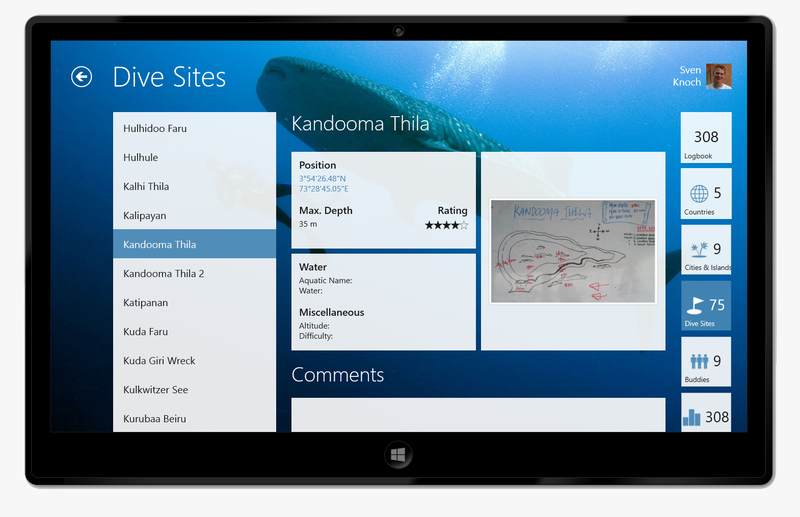 The dive list is sorted descending by default, which means your latest dive is on top and selected. 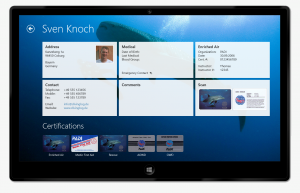 I’ve spend quite some time finding the right UI for the new touch optimized app and it wasn’t an easy task. 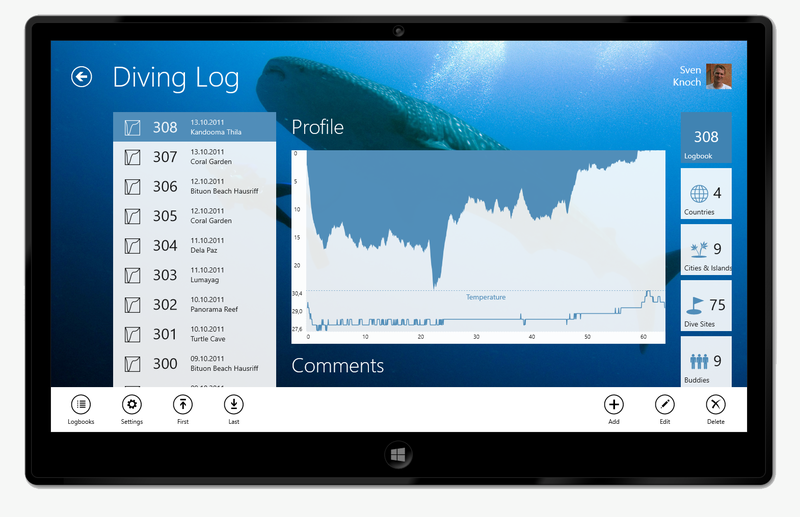 Most existing Windows 8 apps feature a horizontal scrolling layout, but I found out that this doesn’t work well for Diving Log due to the vertical scrolling list on the left. So I’ve created a 3 column vertical scrolling layout, with the dive list on the left, the navigation tiles on the right and the content pane in between. The asymmetrical layout allows you to navigate through the entire app just with your 2 thumbs, when it runs on a tablet for example. You can open the app bar by swiping up from the bottom edge (or right click with a mouse) like in every other Windows 8 app. You can navigate to other sections by either tapping on one of the nav tiles on the right, or by tapping on a blue text link (e.g. a buddy or dive site name). Tap on the back button in the upper left to get back to the previous view. Below you can see the dive site view. Tapping on the coordinates will launch the Bing Maps app and display the dive site. In a future version I’ll integrate the Bing Maps control right into the app. 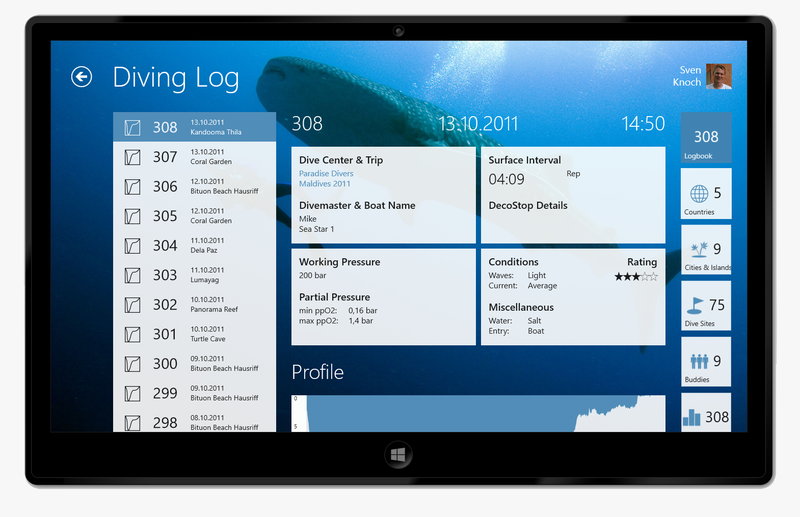 This was the first blog post about the new Diving Log Touch app running on Windows 8. 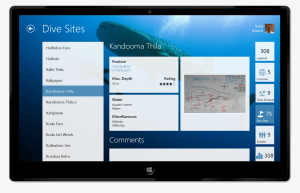 It will be available in the Windows Store next month around the same time of the Windows 8 launch. 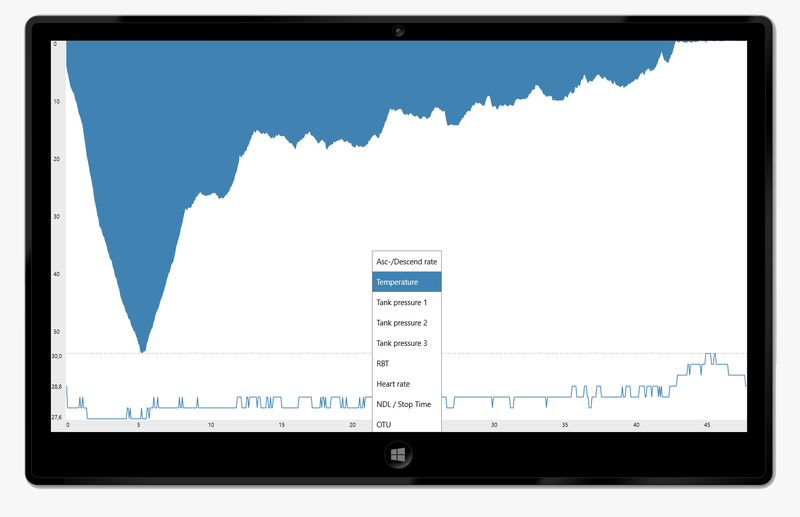 Tomorrow I’ll show you the edit functionality. This entry was posted on Monday, September 10th, 2012 at 3:05 pm and is filed under Diving Log Touch. You can follow any responses to this entry through the RSS 2.0 feed. Both comments and pings are currently closed. My dive buddy and I got our Surface RT devices on Firday and can’t wait for the Touch RT version! Looking forward to using the USB port to download dives from the DC! Will be checking back daily!! 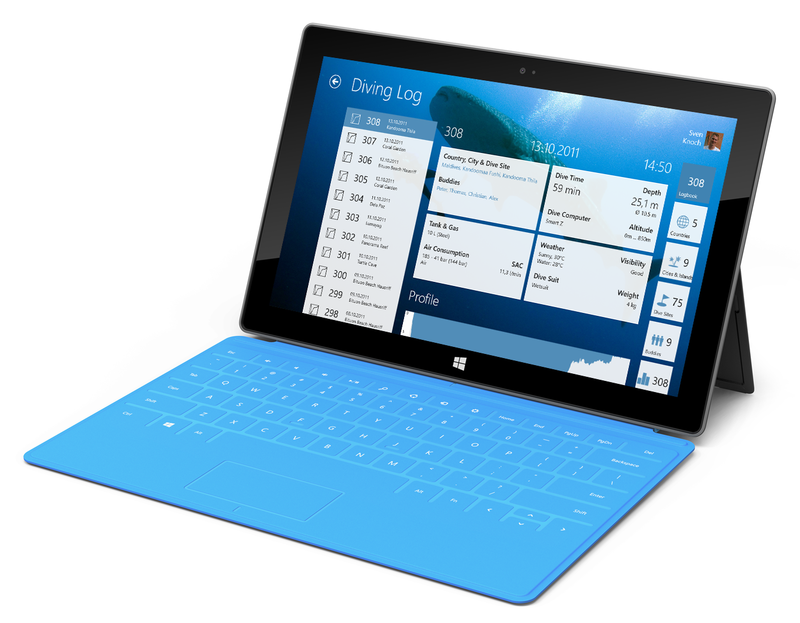 Great to hear you already got your Surface! I’m still waiting for mine, but as soon as I get it I’ll test Diving Log Touch on it and release it for Windows RT as soon as possible. Downloading dive computers on Windows RT unfortunately won’t be possible at the moment. You still need the desktop version of Diving Log for dive computer downloading (which can’t be installed on Windows RT), because the new Windows Style apps cannot communicate currently with serial IO (COM ports), which most dive computers still use (even when they connect via USB). 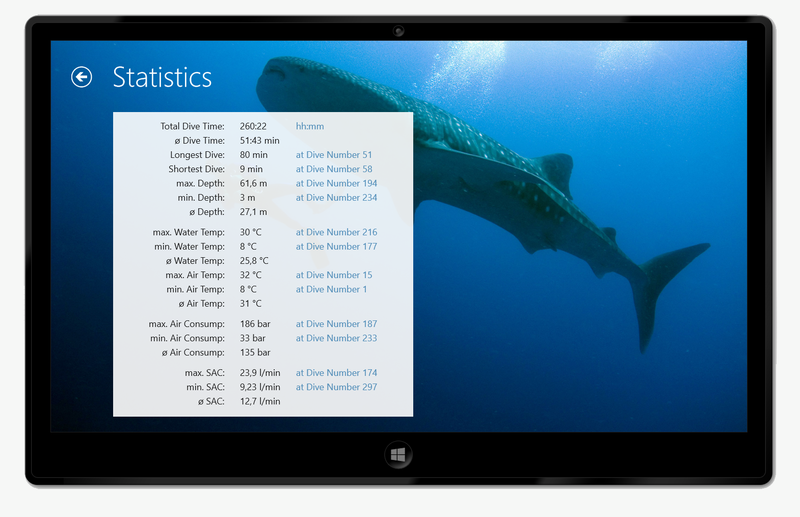 So if you want to connect a dive computer, you would need the Surface Pro with Windows 8, which will be released in a few month. The Windows RT version is now in the Store.